It has been a whirlwind two weeks for the eBay Motors team as it targets both the BTCC drivers’ and teams’ titles at the Brands Hatch season finale this weekend (11/12 October). Colin Turkington currently leads the standings by 50 points having produced a series of standout performances throughout the 2014 campaign, and the Ulsterman is now within touching distance of securing his second tin-top crown. Things haven’t gone completely to plan for eBay Motors in the run-up to the event, however, after Rob Collard’s recent high-speed accident at Silverstone left the team working flat-out in an attempt to build a new machine for the Hampshire driver (see video below for a replay of the crash). Collard’s car barrel-rolled dramatically following unfortunate contact with a spinning rival at the home of the British Grand Prix, which led to the Hampshire driver being air lifted to hospital for precautionary checks. Rob thankfully suffered no ill effects from the accident and has since been passed fit to race. The squad’s main focus of course is on 32-year-old Turkington who has been the standout driver throughout this record-breaking BTCC season. Up against a capacity 31-car grid – including a total of six other former champions – Colin has scored eight race victories and a further ten visits to the rostrum. 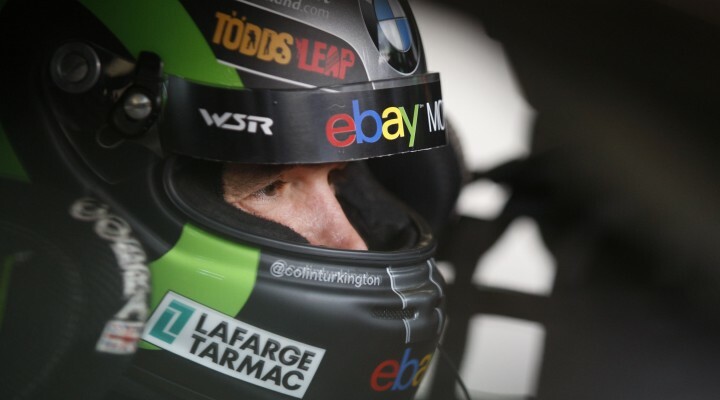 He holds a commanding advantage in the standings going into the final event but with double champion Jason Plato standing in his way, Turkington knows he needs to be at the top of his game. “It’s a huge weekend for the team and I,” he said. “Everyone has worked so hard for this and now is the time to get the job done. I’m just looking forward to getting back behind the wheel of the eBay Motors BMW. I’m feeling relaxed and the car should be on the pace, as it has been throughout the year. “In my mind I have to approach this like any other weekend and I’ve always said that attack is the best form of defence in the BTCC. Being conservative is not really an option as it can sometimes lead to more trouble – it’s best to be fighting at the front. I need to be on the same part of the track as Jason and I’m happy to go toe-to-toe with him if necessary. Nick Foster will also be looking to end his season on a high as well as helping the West Surrey Racing squad to claim the overall teams’ title. He enjoyed a good run around the Brands Hatch Indy layout at the start of the season – scoring a fifth place finish – and he’ll be hoping to beat his season’s best of fourth as Britain’s best championship takes on the legendary Grand Prix circuit. Team Boss Bennetts ­­– who has masterminded the careers of drivers like Ayrton Senna and Rubens Barrichello – has seen it all before of course, but the legendary motorsport figure is as determined as ever to win the championship.